I created a metaball object. 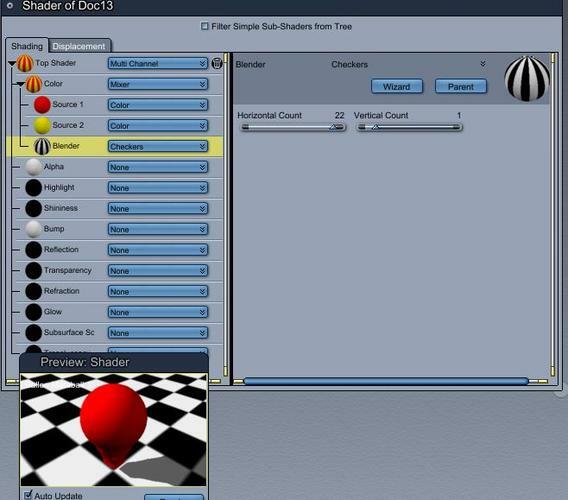 It is resisting all attempts to apply a procedural shader to it, other than a simple color or a texture map. I have tried creating my own mixer, with no luck (the first color in the mixer is applied to the whole object). I've tried using the blue and white checkers preset from the wizard. No luck. I've tried using the 3D paint tool. No luck. 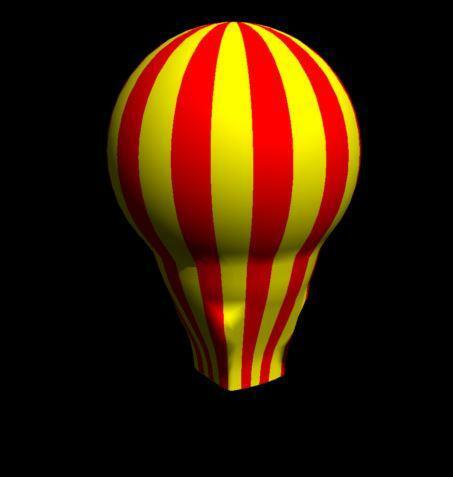 I cannot (a) apply a procedural shader or (b) use the 3D paint tool. Is there a way to apply a procedural texture to a metaball object, short of converting it to a vertex object? 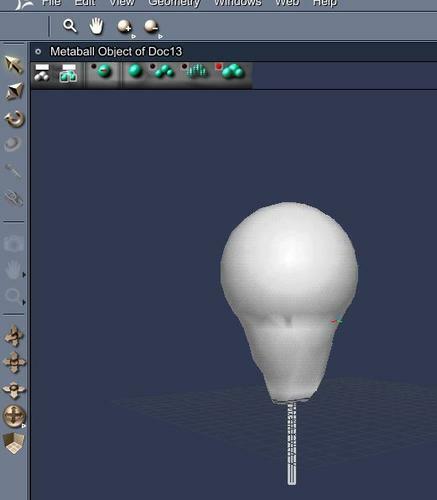 The short answer is that you need to convert the metaball object to a vertex model. The longer answer is essentially the same except that I believe the reason is that Carrara can generally guess about how to apply an image to an un-UV mapped vertex object, spline object and primitive. It cannot do this with a metaball object because it isn't locked down. It's still fluid as it were. The bear picture is a metaball object converted to a vertex object with shading domains defined and it is even rigged. The youtube video uses meta-ball asteroids converted to vertex objects and then textured using the spherical projection mapping. I was hoping to avoid that. No big deal. Just adds another step or two. Sorry I couldn't give a better reply. I also would love the ability to use more complex shaders on a metaball object. I'll have to try again, but I haven't had much luck unless they were converted. Could you post some examples? I've never done anything with metaballs but make splashy particles "water" or lavalamp-looking blobular stuff. Chalk one up for Wendy! I just tested it and it worked as expected. Okay, okay, I'm man enough to admit when I'm wro- wron- wr...... wrong. You mean metaball objects? The teddy bear I posted above started life as a metaball object. The only thing I did was convert to a vertex object and add a shading domain and hair. It was a mess of triangles but it worked. I did a simple rig as well for posing. The eyes/buttons are spline objects grouped with the bear model. 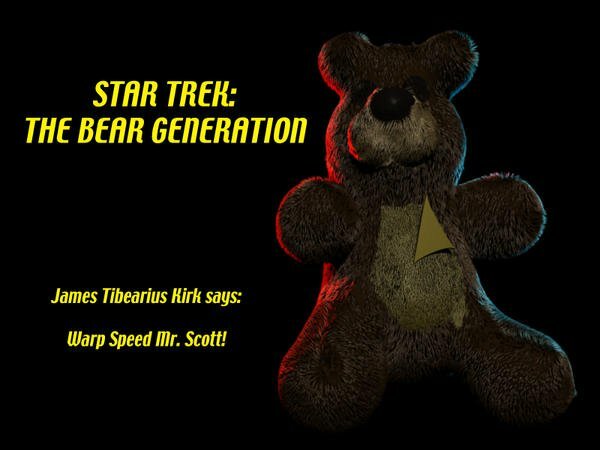 Here's a link to the teddy bear scene file. Please "bear" in mind that at the point I saved the file it was already converted to a vertex object. BTW, the rig is kind of crappy, but it served my purpose. Wendy - you are amazing. Well, as per the request for screen shots, here goes. - Metaball object that combines two positive spheres, 1 positive box, and 1 negative cylinder. It is the start of a balloon. - Tried to apply a multichannel mixer to get red and gold vertical stripes. 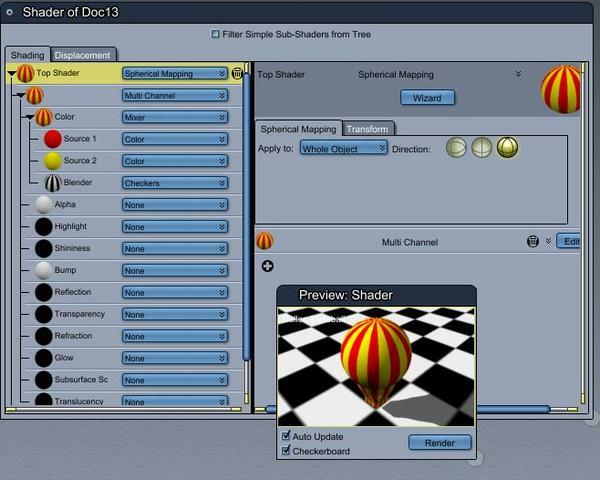 Didin't work with a multichannel choice in top level shader. - Changed multichannel to PROJECTION : SPHERICAL in top channel. Reapplied multichannel mixer. Works fine now. Hey, Wendy - that is really cool! How do you manage to get the metaballs to flow fluidly for the animation? I like to use the metaballs in animation, but they are difficult to handle !